Running in Cleveland, Ohio. 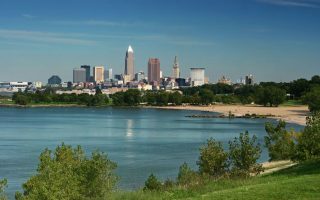 Best routes and places to run in Cleveland. Cleveland is located in northeastern Ohio on the southern shore of Lake Erie. The city has been undergoing a rejuvenation of late, with great has helped the running scene in a big way. 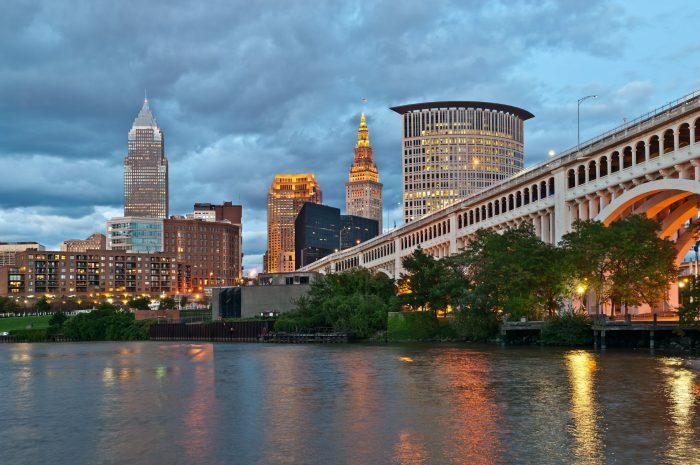 Many of the best places to run in Cleveland are accessible from downtown, including the beautifully restored Lake Erie and Cuyahoga River waterfronts, incorporating a 15-mile bike path and a 60-mile string of parks and treed greenbelts known as “the Emerald Necklace”. Another great running area is Rockefeller Park from downtown out to University Circle, and enjoy a loop around Cleveland’s universities and art institutions. 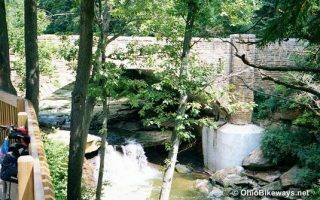 The Towpath Trail begins in Cleveland and runs for 84 miles into the heart of the Cuyahoga Valley National Park. 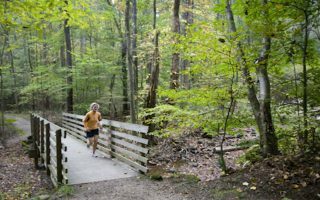 With all these beautiful and well- maintained places to run, it is no wonder that Cleveland has an active running community. If you’re hoping to access all the parks that Cleveland has to offer, it is best to have a car. However, Cleveland has a well developed bus and light rail transit system, so getting around the city on public transit within the main metro area is easy. The Airport is only about 12 miles away from downtown and is accessible through public transit. This path spans the entire length of Cleveland’s 17-mile Lake Erie shoreline. Highlights include Cleveland’s best architecture in Collinwood, Bratenahl, and scenic Edgewater State Park. We've mapped the route and point out the best sections. A 3-mile linear park along Martin Luther King Jr. Drive and Superior Avenue. Bike path runs along MLK Drive between University Circle and the lakefront. Can add on at the lake, or in University Circle area. Nice running on the paths and promenades around Case Western, Cleveland Museum of Art, Severance Hall. Can do 3-4 miles there, and extend north or south along linear park paths. A series of reservations linked together to form the giant green (emerald) necklace around the outskirts of the city, with 70 miles of paved “all-purpose trail”. We've included a guide to some of the running highlights, with maps. Many sections hilly! Extensive, 84-mile trail starting 5 miles south of downtown. Historic buildings, museums, pleasant villages, restaurants, pubs, and wildlife. Highlight is Cuyahoga Valley National Park, where you can run one-way and hop the CVSR to return. Popular spot 20 miles south of downtown, with signature loop around the lake. Can be done as a 3.1 'trail run' or 3.3 mile all-purpose trail. Other trails as part of the Reservation as well. Typical of the Great Lakes region, Cleveland has four distinct seasons. Summers are hot and humid while winters are cold and snowy. 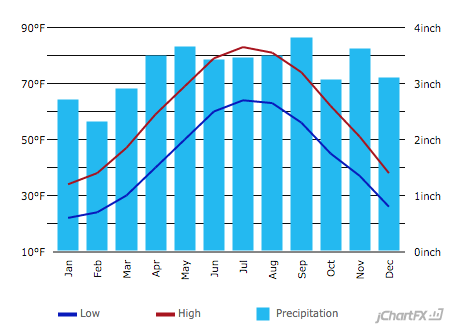 From mid-November until Lake Erie freezes (usually in late January or early February), lake effect snow is typical in Cleveland. In the Snow Belt, extending from Cleveland’s East Side to Buffalo, it is not uncommon for seasonal snow totals approaching 100 inches. However, the West Side of the City is less burdened by snow. Frequent thunderstorms are common especially during spring and early summer. Depending on the season, be prepared for the weather. Cleveland’s downtown area is focused near the Lake Erie shore. The main portion of hotels are clustered in this area near the Cleveland Brown’s Stadium and Rock N’ Roll Hall of Fame. Hotels in this area have easy access to the Downtown Waterfront Loop and Cleveland Lakefront Bikeway. 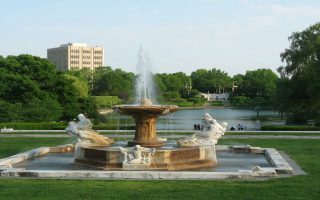 A second cluster of hotels are located near University Circle where Cleveland Museum of Art, Cleveland Museum of Natural History, Wade Park and Case Western Reserve University are located. 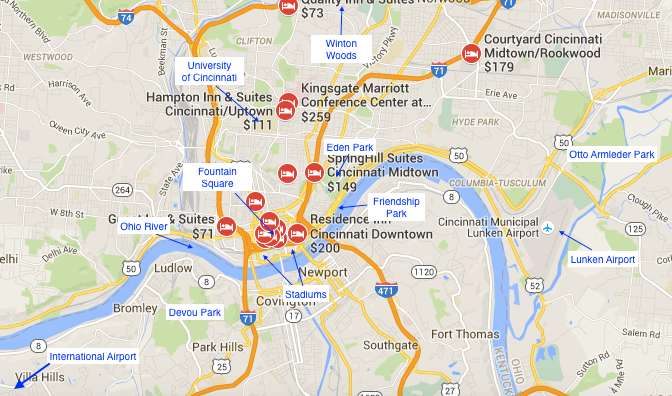 The Rockefeller Park and Shaker Lakes routes are accessible from these hotels without a car. 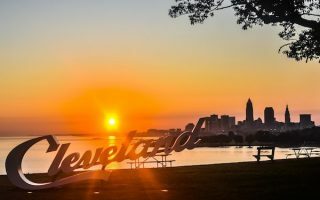 The Lakewood neighborhood hosts a few hotels which are close to Edgewater Park. Of course, there are a few hotels near the Cleveland Hopkins International Airport. Airport hotels are conveniently located near Rocky River Reservation. 2nd Sole Rocky River. Home to Sole Train Run Group. This group is free, open to the public and meets five times a week. Fleet Feet Sports Pepper Pike. Hosts monthly pub run, see website for meeting point and details. Second Sole Athletic Footwear Lyndhurst and Mentor. Home to the Second Sole Striders. Group meets Wednesday and Sundays, see Facebook for details. Achilles Running Shop. Mentor. Hosts group runs between 2–5 miles checkFacebook for details. Northeast Running Club Hosts group runs Monday, Wednesday, Thursday, Saturdays. Check Facebook for up-to-date details. Cleveland has a very active running community and that leads to frequent running events! Cleveland Marathon May. Also a half marathon, 10K and 8K. Towpath Half Marathon April. Also 3 mile and 5 mile race. Towpath Marathon October. Also 10K, half-marathon. Rock Hall Half Marathon August. 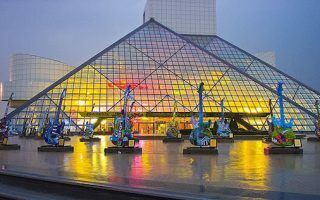 With the Rock And Roll Hall Of Fame as the event’s title sponsor, this race is guaranteed to end your summer with a blast! Buckeye Half Marathon. October. Popular half-marathon and two-person relay. Hermes Cleveland 10 Miler April. At Edgewater Park. Cleveland Turkey Trot Thanksgiving. 5K and 5 miler.